// to avoid a clash with the function name beta. // Parameter estimators of alpha or beta from mean and variance. RealType mean, // Expected value of mean. RealType variance); // Expected value of variance. // either alpha or beta, and x and probability. RealType beta, // from beta. RealType x, // probability x.
RealType probability); // probability cdf. The class type beta_distribution represents a beta probability distribution function. The beta distribution is used as a prior distribution for binomial proportions in Bayesian analysis. See also: beta distribution and Bayesian statistics. How the beta distribution is used for Bayesian analysis of one parameter models is discussed by Jeff Grynaviski. where B(α, β) is the beta function, implemented in this library as beta. Division by the beta function ensures that the pdf is normalized to the range zero to unity. The following graph illustrates examples of the pdf for various values of the shape parameters. Note the α = β = 2 (blue line) is dome-shaped, and might be approximated by a symmetrical triangular distribution. If α = β = 1, then it is a __space uniform distribution, equal to unity in the entire interval x = 0 to 1. If α __space and β __space are < 1, then the pdf is U-shaped. If α != β, then the shape is asymmetric and could be approximated by a triangle whose apex is away from the centre (where x = half). Constructs a beta distribution with shape parameters alpha and beta. Requires alpha,beta > 0,otherwise domain_error is called. Note that technically the beta distribution is defined for alpha,beta >= 0, but it's not clear whether any program can actually make use of that latitude or how many of the non-member functions can be usefully defined in that case. Therefore for now, we regard it as an error if alpha or beta is zero. Constructs a the beta distribution with alpha=2 and beta=5 (shown in yellow in the graph above). Returns the parameter alpha from which this distribution was constructed. Returns the parameter beta from which this distribution was constructed. Two pairs of parameter estimators are provided. One estimates either α __space or β __space from presumed-known mean and variance. The other pair estimates either α __space or β __space from the cdf and x. It is also possible to estimate α __space and β __space from 'known' mode & quantile. For example, calculators are provided by the Pooled Prevalence Calculator and Beta Buster but this is not yet implemented here. Returns the unique value of α that corresponds to a beta distribution with mean mean and variance variance. Returns the unique value of β that corresponds to a beta distribution with mean mean and variance variance. Returns the value of α that gives: cdf(beta_distribution<RealType>(alpha, beta), x) == probability. 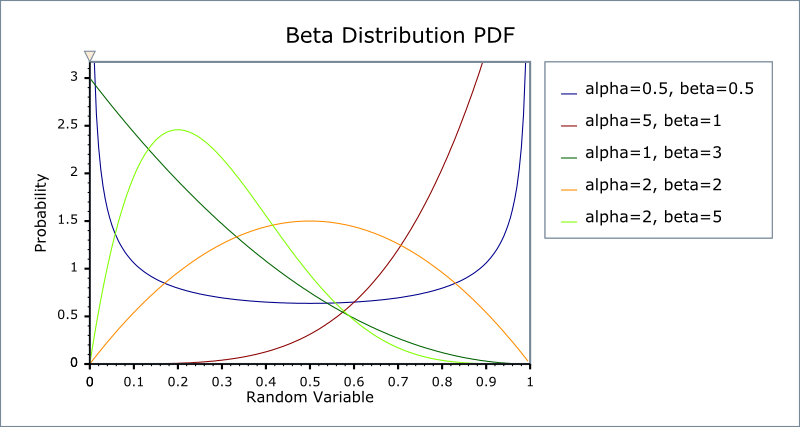 Returns the value of β that gives: cdf(beta_distribution<RealType>(alpha, beta), x) == probability. The formulae for calculating these are shown in the table below, and at Wolfram Mathworld. The beta distribution can be used to model events constrained to take place within an interval defined by a minimum and maximum value: so it is used in project management systems. It is also widely used in Bayesian statistical inference. The beta distribution with both α __space and β = 1 follows a uniform distribution. The triangular is used when less precise information is available. The binomial distribution is closely related when α __space and β __space are integers. With integer values of α __space and β __space the distribution B(i, j) is that of the j-th highest of a sample of i + j + 1 independent random variables uniformly distributed between 0 and 1. The cumulative probability from 0 to x is thus the probability that the j-th highest value is less than x. Or it is the probability that that at least i of the random variables are less than x, a probability given by summing over the Binomial Distribution with its p parameter set to x. This distribution is implemented using the beta functions beta and incomplete beta functions ibeta and ibetac; please refer to these functions for information on accuracy. In the following table a and b are the parameters α and β, x is the random variable, p is the probability and q = 1-p. Implemented using ibeta_derivative(a, b, x).